This post has been amended to include an additional comment from U.S. 3rd Fleet. Ships from the People’s Liberation Army Navy (PLAN) have already been invited back for future Rim of the Pacific (RIMPAC) exercises, Chinese state media reported on Tuesday. 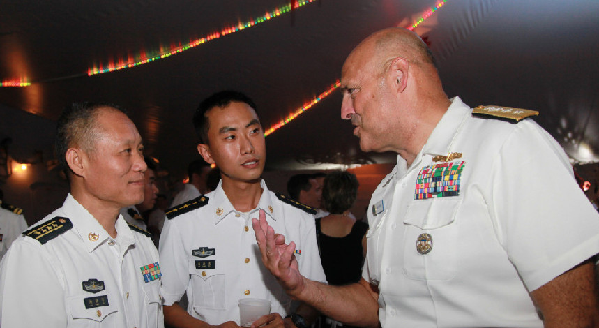 Commander of U.S. 3rd Fleet — Vice Adm. Kenneth Floyd — extended the invitation to PLAN Adm. Zhao Xiaogang during a visit to the Chinese ships participating in the exercise on June 28, according to the PLA Daily. Representatives with 3rd Fleet told USNI News on Wednesday the move is not out of the ordinary. “All RIMPAC participants are routinely invited back,” Cmdr. Charlie Brown told USNI News. Brown later elaborated, following an earlier version of this post, that formal invitations to countries will go out following the exercises from the commander of U.S. Pacific Fleet. The Chinese were invited to RIMPAC 2014 in 2012 by then Secretary of Defense Leon Panetta. The Chinese sent four ships — the destroyer Haikou (171), hospital ship Peace Ark, frigate Yueyang (575) and oiler Qiandaohu (886). As Chinese – U.S. military relations improve, the PLAN contingent could grow for RIMPAC 2016 as well as the range of exercises in which the PLAN participates. For the current exercise, the Chinese are participating in range of training to include humanitarian aid and disaster relief (HADR) and naval gunnery. Chinese media has called the invitation a sign of improved relations with the U.S., according to a Wednesday report from Jane’s Navy International. “Beijing is unlikely to turn the invitation down, and the PLAN may make more significant contributions at future editions of RIMPAC,” according to Jane’s.